My submission to display a poster at the Immersive Education Conference held in Boston this June (500 words or less!). 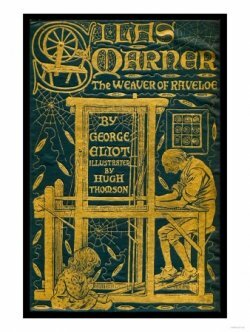 Consider how Silas Marner (George Eliot, 1861) was deemed an outcast with his whirling, magical technology: the weaving loom. Educational technologists have a daunting job: to encourage and assist educators to integrate technology into their curricula. Why is this so daunting? Because many teachers are resistant (if not oppositional) to using technology in their classrooms. Like the early 19th century Luddites who smashed mechanical looms, some educators view technology as a transitory hindrance to their craft of teaching, and it’s no wonder. Teachers learn about technology from their school’s educational technologists, who have been misperceived as merely well informed “AV techs” since the 1930s (Simsek, 2005). What is omitted in this AV tech stereotype? Educational technologists are also educators. Like teachers, they need the pedagogical skills necessary for creating safe learning environments, and for motivating teachers to be self-directed learners of technology. Unfortunately, much of the professional development for educational technologists is overtly girded with techno “bling”, i.e., the newest, shiniest technologies, and the newest, hippest ways of using them. There is little regard for the social and pedagogical skills necessary to promote these technology skills to teachers. A quick survey of professional development opportunities for educational technologists shows classes in mobile device learning, Google Apps use, and freeware (COSN, ISTE, Google Teacher Academy, 2012). There is little concerning methodologies for creating autonomous, competent teachers for example, or ways to acknowledge a teacher’s efforts toward self-determination regarding technology use (Ryan and Decci, 2000). To alleviate this dearth of pedagogical training, we have designed a quasi alternate reality game (qARG) with a process knowledge goal of teaching and motivating teachers, coupled with a content knowledge goal of using accessible, common technologies, such as mobile devices, blogs, project management systems, social media, and websites. Last of the Luddites has been accepted by the Technology in Education Partnership of Massachusetts, and will be played with an estimated 300 participants at the Technology in Education: 2012 Conference and Expo, to be held in June. It is serious game (Abt, 1970) with a goal-based scenario (Schank, 1994) framework. The cover story is that of a fictitious business that hires consultants to assist teachers with their technology issues, through use of video. A player earns professional development credits in this alternate, yet realistic reality, as they play the role of consultant for this company, assisting teachers in various ways. Although the game is anchored in a blog, players travel throughout the Internet, picking up clues and collaboratively problem-solving with fellow players. However, finding solutions for the teachers is not the only task. Players are also rewarded for their method of delivery; the way they respond to the teacher determines whether or not the teacher actually takes their advice and applies it, as opposed to just saying “OK”, when in actuality they are too proud to admit they do not understand the advice. Our poster will illustrate the epistemological underpinnings of the instructional design, the methodology and execution of the game, and our reasoning for calling it a qARG rather than an ARG. I agree. Teachers have technology at their disposal but seem unaware of its effective use in the classroom. Case in point are smartboards, the must have tool in the classroom of a few years back. I often sub in classrooms where the teacher rarely leaves any plans that utilize the smartboard. Furthermore, if they do, they use it as a high tech overhed prohector, which is fine, but the idea is to engage students interactively. Hi Layne, I agree about the smart board. They are meant to be TOUCHED by the hands of children! I taught an after school program using SCRATCH. We were having a great class one day; I had 2 students programming an animation on the smart board. They were extremely engaged—I was then told the smart board is strictly for teacher use only. No kids allowed. What a shame. It seems to be under used (whiteboards) in regular education classes. However, from my own personal experiences as a para-pro in special education classes, the teachers I have worked with have used it as an interactive tool, encouraging students to use the tactile, audio and visual aspects of what the smartboard offers and do manipulate objects it in a very contructive way.